Thunder Cash slot is one of the few games where the title seems irrelevant to the content. It had me initially expecting Norse Gods like in Thunderstruck 2 and Thunderfist, but alas all we see is a game set over the background of an empty casino floor with the 'thunder' seemingly added as an afterthought. You get the 'trotting' sound as the reels spin as with most Ainsworth games (along with EGT and Novomatic too) and the music when a win occurs, so nothing really to excite us yet. Can the Thunder here awaken me from my slumber though? As said the game has more in common with the background than the title and we see this represented on the 5 reels of 3 rows and their 20 pay lines. There are various icons you'd see in a casino with Red 7's being the best at 25x bet for a full line of 5, Diamonds at 20x and Casino Chips or Craps Dice paying 10x. Naturally card values make up the remainder awarding 5 to 7.5x for 5 but we do get scatters with the game's logo which would pay 100x bet for all 5, plus 3 or more would trigger the bonus game. If we now consider the Wilds, then as these have a flash of lightning on them we can now at least see something relating to the Thunder Cash name, although you only see them on reels 2, 3 and 4. 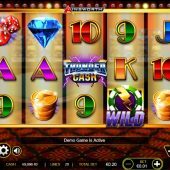 Three or more logo scatters trigger a free spins bonus. Eight or more free games will begin and three or more scatters will award an extra 5. That would be useful as the Wilds are sticky in these spins but only appear still on the centre reels. You will usually see frequent wins in this round and the Wilds aren't hard to land but beware! - the pays are all halved, gee thanks Ainsworth.